I want to discuss the topic of isolated showers. 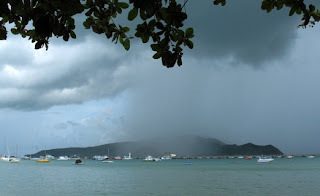 Today in Phuket has been a rainy day... but I have not been in the rain, indeed things have stayed sunny pretty much all day for me. The rain here does not tend to blanket the entire land in a grey shroud (like England). We get isolated showers. My wife just called me and said it had been bucketing down at home (only about 10km as the crow flies, or 18km as the bike rides). Not rained here in Karon Beach. The dark clouds approached.. would we get wet? 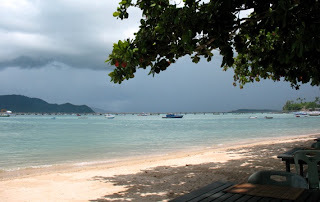 I just found last week that all photos that have been uploaded to my blogs have their own pages on Google's Picasa Web Albums - so here's the Phuket Weather Photo Album. Oh, and if you have time, please give the Phuket Weather Blog a nice big high score on the Top 100 Thailand Blogs... you'll find it somewhere around number 30 at the moment.